I’ve been writing technical bits and pieces for many years and on several websites. Some of it brief notes, but some articles are rather beefy. Usually the subject matter is focussed on a single short subject, with anything between 300 and 2000 words, sometimes more. When I entertained the idea of describing how to install CentOS on a laptop, with the intention of installing a LAMP stack on top of it, then access it from web browsers on my internal network, I was faced with a new challenge: The subject was so deep this it simply wasn’t blog material. If anything, it was a series. Thinking of the poor souls who may want to follow my advice (my future self included), everyone would bet better off with a single document rather than a series of interlinked posts. Julia suggested I should turn the idea into a book – and I liked it. I had tried my hand at writing a book about Plesk for some time. This LAMP Stack project was something that would tie in, almost as a prequel to the Plesk book. As soon as I started writing, the words seemingly flowed out of my fingers. The first draft was done within two weeks. I started writing in mid February 2015, followed by another week of corrections. Then came the tough part: publishing the book on Kindle. Because I’m a “Mac Guy” these days, I had started to write the book in Pages. Turns out that was a massive mistake! While Pages looks beautiful, and is probably a great choice for diaries and documents shorter than 10 pages, a project of 37.000+ words is very difficult to navigate. Besides, Apple have “improved” Pages over the years and taken valuable functionality away – for example the ability to add hyperlinks inside a document. It was there once, but it’s gone today. 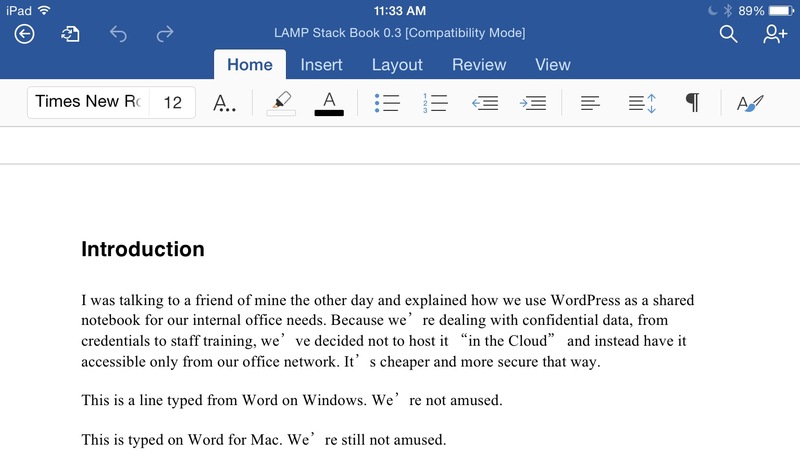 Turns out that I had to go back to my old friend Microsoft Word: Amazon’s system is happy to accept Word documents as they are, complete with images. KDP does a great job at converting Word documents to the Kindle format – IF styles are applied correctly. Ugly indeed! Turns out that these single characters had a different style applied than the rest of the body text. We worked it all out in the end, but it took two weeks of head scratching – not pretty when all you want to do is “get on with it”. But that’s for another time. Julia did a marvellous job at spotting spelling mistakes and missing words that my brain kept filling in automatically – so she gets a well deserved Editor credit on this publication! One thing I love about tech books on the Kindle is the clickable table of contents. It’s such a popular feature that Amazon require it with every book you submit. Word 2011 for Mac will quite happily create a table of contents, but to my surprise it didn’t do so with the appropriate hyperlinks. Without them, the TOC is not clickable, defeating the object. There is a way to add those links manually, but not only does this cost vast amounts of time, but all links are wiped out if you update a headline in the document! While Word for Mac does a great job at everything else, it doesn’t do automatic hyperlinks. But the PC version of Word 2010 does this – and thankfully it’s 100% compatible with the docx files either version creates. So I had to work in both versions: update the TOC in Windows, and replace wonky styles and add corrections on the Mac. The Windows version of Word 2010 doesn’t have the elegant and intuitive features that the Mac version offers, so going back and froth was working really well for me. Go figure: three text processors to write one relatively simple book. We also needed a cover image for the book. Even though there are Kindle books without a cover, they look ridiculous. Thankfully Julia had discovered an web app called Canva in which she created several sample designs. Canva is a great example of what’s possible with web applications these days. 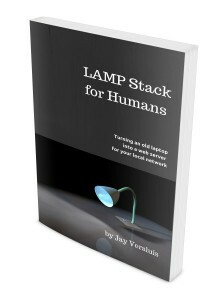 Because the title of the book is “LAMP Stack for Humans”, my initial idea was to build a literal stack of 3D lamps on a desk. The term “LAMP Stack” has nothing to do with illumination though: it’s an acronym for Linux, Apache, MySQL and PHP. It was perfect! We stopped looking immediately. This particular lamp was built in Hexagon and rendered in Carrara. The “soft cover” effect was created in Photoshop (I’ll ask Julia to explain it to me someday). It didn’t take long for the book to go live: perhaps two hours from the initial upload. 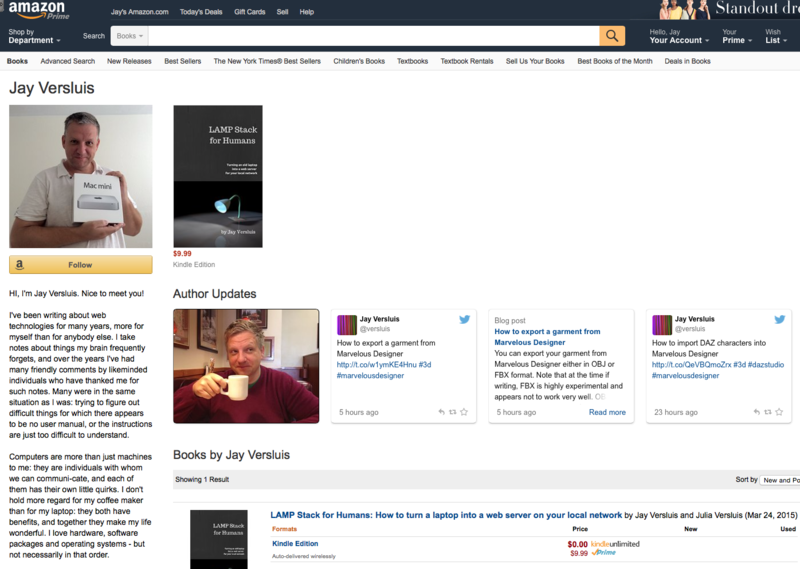 Amazon sent me an email as soon as it was available and encouraged me to create an Author Page. I always wondered who took care of those (and why so many of them look so empty). The white space next to my first book is encouraging: there’s room for at least 5 more books (alternatively, I could make my browser window smaller). Right now the book is available exclusively through Amazon’s Kindle store. There are countless other ebook portals of course, such as Google Play Books, Apple’s iBookstore, Barnes and Noble, Kobo, Leanpub, you name it. Each outlet requires a different format though, and right now I really don’t know if it’s worth going through the hassle of re-formatting the book. I’m happy that it’s available on the world’s largest ebook store and that the project is finished. Besides, I personally buy all my books through the Kindle store – I don’t really look anywhere else. I even do most of my shopping on Amazon, so it feels like a natural match. We’ve also enrolled the book in KDP select, making it available for free to Prime members through the Kindle Owner’s Lending Library. I wrote my first book back in the late nineties (as in twenty years ago!). It was a collection of what we would call blog posts today, entitled “Die Now”. This was followed by a collection of short stories about a secret government agent called Sam Ügholm. Before that, in the mid eighties, I wrote a short novel which poked fun at my teachers at school. And before that I published a satyrical school newsletter. You could say that writing has always been in me – contrary to what the German school system had me believe. Since then I’ve published countless posts on my various websites, on a variety of subjects, and it feels good to dump my brain to virtual paper – especially if other humans find my knowedlge useful. My talent is in explaining highly technical procedures so that others – including my future self – can understand how to accomplish things we don’t do every day. The approach for a blog post is very different from writing a book: while a good blog post requires an hour or two of focussed attention, a whole book requires several weeks of work and an overall “story arch”. The corrections alone take as long as the writing process. LAMP Stack for Humans is my first “real book” which has a beginning, middle and an end, and it’s about a rather complex and cohesive subject matter. It was a different experience for me, but I must say I enjoyed it. Last year I started writing a book about Parallels Plesk, but I got stuck halfway through. Maybe I had set my standards and expectations too high, aiming for a deadline – which ruined the whole process for me. “Plesk for Humans” sounds like a good sequel to the current book though. The empty space on my Amazon author page is very encouraging. I really enjoyed reading your book and it helped me a great deal while I set up my first LAMP stack using Ubuntu Server 14.04. A couple of hiccups here and there, along with more than a little head scratching at times (my fault, not yours). But, it’s still running smoothly almost a year later. I read it on Kindle Unlimited, but eventually unsub’d because of the dearth of good books to my tastes (I can’t bring myself to read a book that I don’t learn from, thus limiting my choices to non-fiction). Your book was the only one I read that I really miss having on my Kindle. I shall rectify that shortly when I buy my own copy. All my best and keep writing. You do it very well.